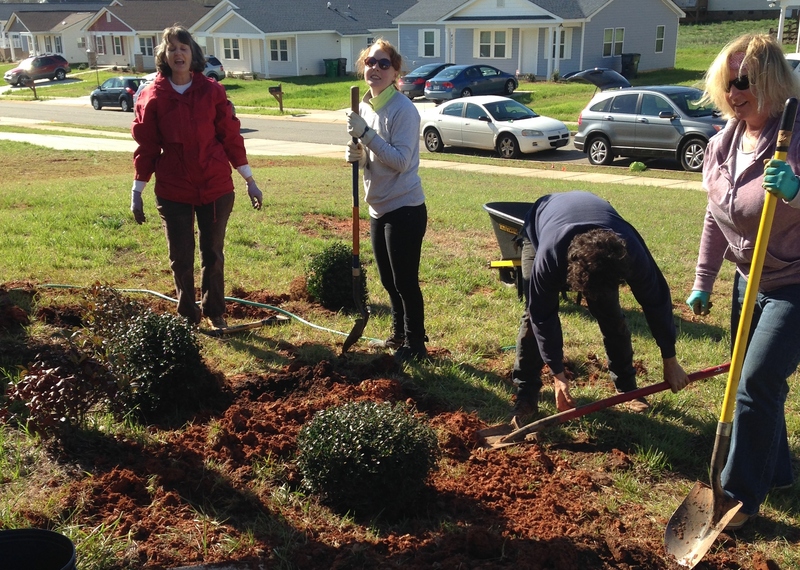 Volunteers from the Charlotte Garden Club and a number of young people from the Charlotte area spent Saturday morning installing landscape for three Habitat for Humanity built homes in north Charlotte. The group was directed by Michael and Michelle Styers. Michael is Curator of the Bowles Garden in Charlotte, and they lent their expertise to all of us. Three homes were supplied with shrubs and trees. That red stuff in the picture is good old Carolina red clay. With all the moisture we have had over the past winter into spring, it wasn’t the easiest in which to dig planting holes. Thankfully, there were willing hands and young backs that stood up to the test. 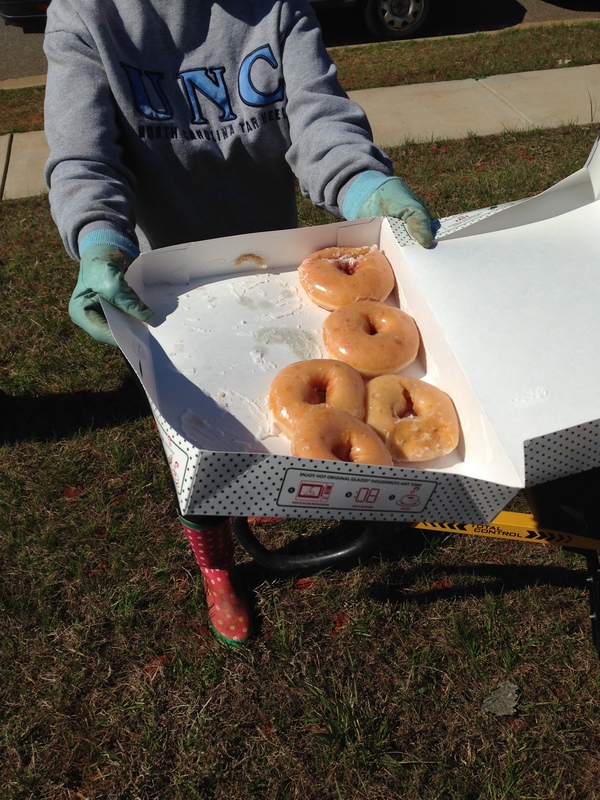 There were ample rewards for all the volunteers! 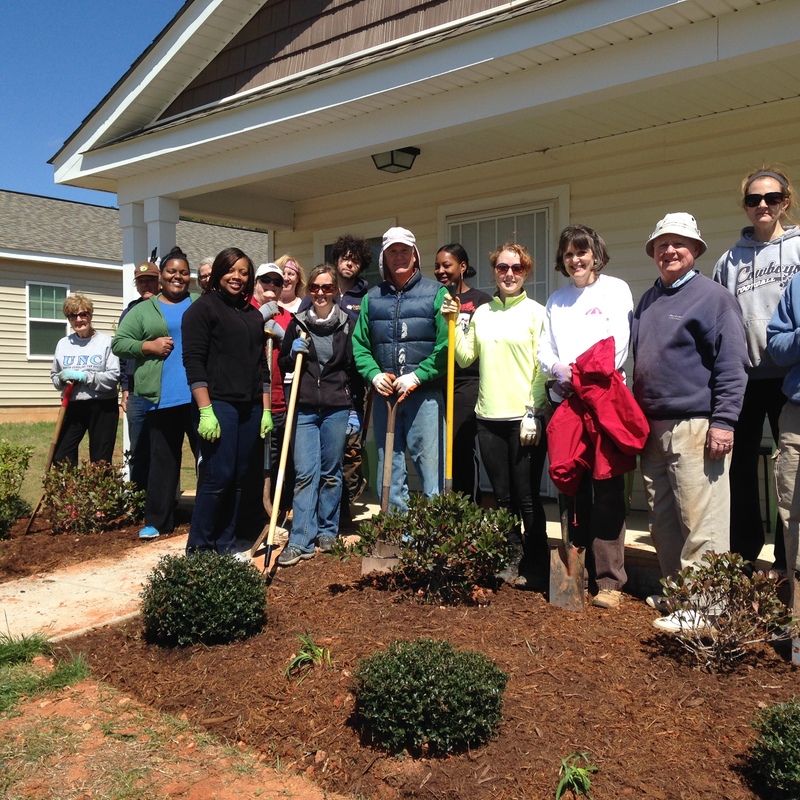 The Charlotte Garden Club has been supporting Habitat for Humanity for the past four years each spring and fall as a service project, supplying plant material, soil amendments, mulch, and hands-on labor. 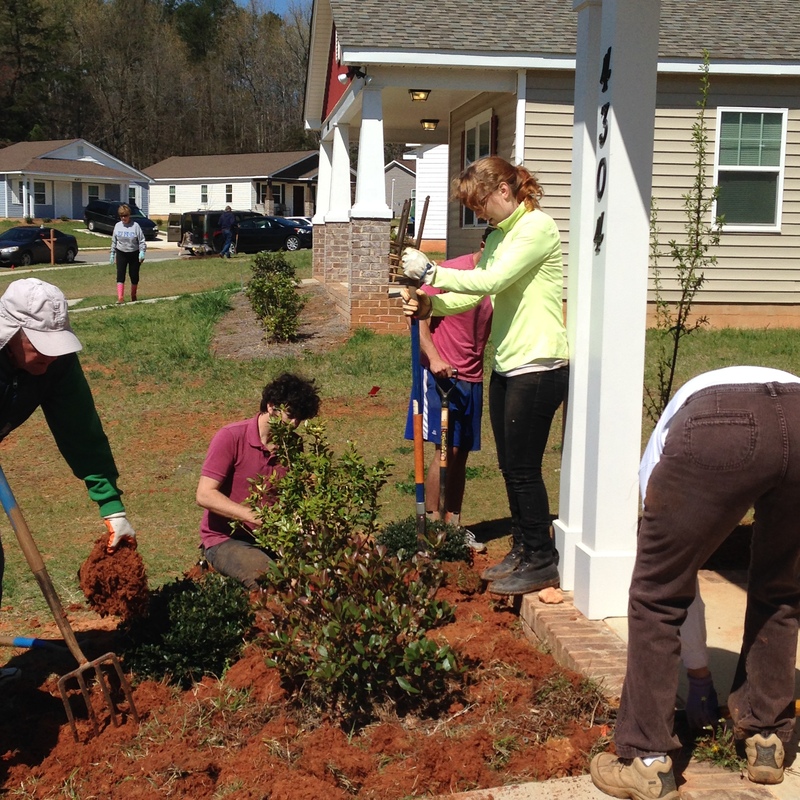 The Club sees it as important support for the Charlotte community and for Habitat for Humanity. This entry was posted in Things I See Around Town and tagged Charlotte Garden Club, Habitat for Humanity. Bookmark the permalink. What a wonderful project, so good to get everyone involved. Your soil is just like our red Devon clay, just as well I was 25yrs younger when I was digging new beds! Thanks, Pauline. I would love to report that it was good exercise, but my back would tell you “not so.” Fortunately, most of the heavy digging was done by younger folks. Sounds a great project to be involved with John, that must of been a very rewarding morning. I don’t envy the clay, but the work and company and finished results are really something to be proud of! Thanks. 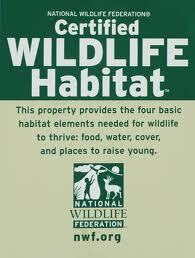 We have always enjoyed doing this as a group and interacting with the home owners. The red clay looks all too familiar John. That must have been quite a job. Thanks, Susie. I can tell you that I was tired afterward, but it was worth the effort. 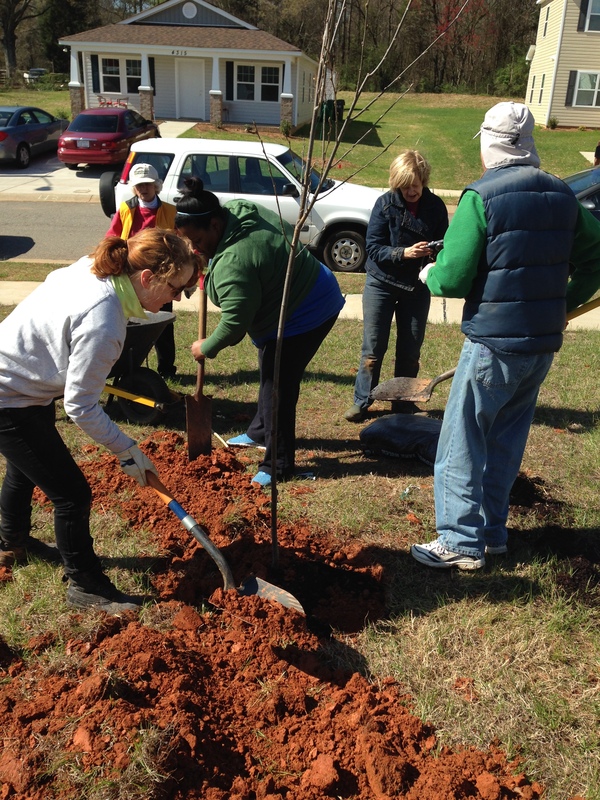 It’s a great project for a garden club to do in the community. Good work! I like it when gardeners reach out to those in need of a helping hand with the basics of life. Were those Crispy Creme donuts? of Course! Are there any other kinds?